Wishing Well, is a beautiful fully furnished two bedroom cottage lovingly renovated in a charming countryside style, perfect for a small family or couple. 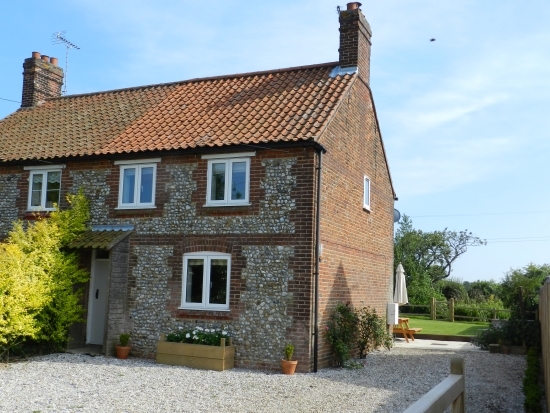 This dog friendly Norfolk cottage is complete with a spacious and well cared for garden overlooking the rolling fields and even boasts a traditional Wishing Well and dog run! Nestled in amongst the brick and flint cottages of Thursford, the semi-detached Wishing Well is peacefully set back from the road behind wooden gates with a large gravel driveway that includes ample space for two or more cars. Entering through the front door you are welcomed into the large hallway that leads off to the living area, a cosy space with a traditional log burner, comfy sofas, perfect for relaxing in the evenings. Following through the hallway you enter the character-filled south facing dining area, with an exposed brick fireplace, restored wooden doors and pamment tiled flooring and log burner. Cleverly stowed away behind the wooden doors are a pantry space and the fridge/freezer, ensuring that the rustic charm of the cottage is not diminished by the sight of modern kitchen appliances. This is also apparent in the hand-built kitchen, beautifully finished in a fresh blue, with large skylights and windowed doors, there is no end of natural light for you to enjoy in this highly functional space. The stylish slate tiles provide underfloor heating for when the weather gets cooler, and radiators elsewhere in the house will surely keep the winter weather at bay. Leading out of the kitchen door you are greeted by the sheltered south and west facing patio space overlooking stunning views of the fields beyond the cottage. This makes for the perfect outdoor dining area during the summer as it is a real sun-trap, and the adjacent outhouse provides a discreet heated laundry room, fitted with washing machine and airer and even more storage space. Returning to the main house, the carpeted stairway leads to the first floor and the large master bedroom, situated towards the front of the cottage with large windows providing lots of natural light and views across open farmland. The large cast-iron king sized bed and set of built-in double wooden-shuttered wardrobes provide a great amount of space, combined with the decorative Victorian fireplace for a warmly rustic atmosphere. Across the landing is the second bedroom with views overlooking the garden and fields beyond and is fitted with two single beds. Next door is the well-sized bathroom, finished to a very high standard with a large bath with stand-up mains pressure shower.